You haven't driven since you were.......................20? Big congrats to you guys, I know how hard you have worked on it and can't wait for next year. You haven't driven since you were.......................20? List has been updated. New list includes top 10 in each category in the sticky thread. This gives someone the chance to knock someone off the list and move up. So wonder who's next?? 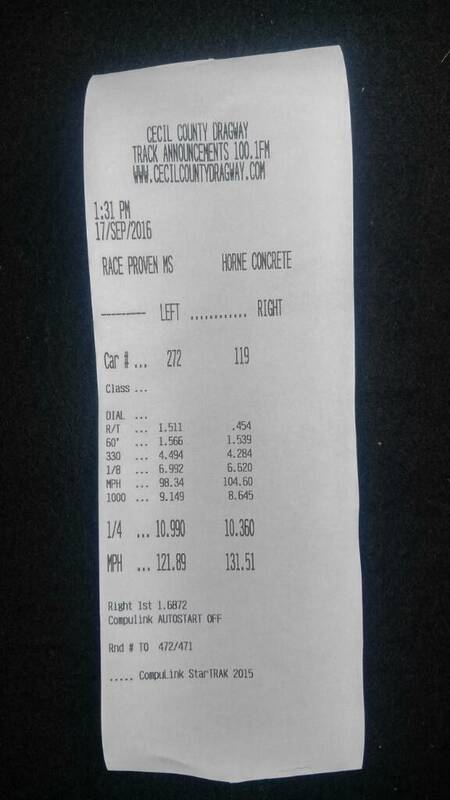 I went 6.88 at 102 qualifying for TAI at Bowling Green this year. Bryan or JD has my time slip. Melissa got her license yesterday and we got to run it out. Sweeeeet! Making some killer power. That cool air yesterday was on her side. Russ sent me a pic of the slip yesterday. Very impressive. That new intercooler is doing well. I wish I could have seen that run. Too busy at work to take time right now. Wow nice!!! with a slic?? Holy Crap! That's haulin' the mail. First time out with the car. 3rd pass all on 18" Nittos and "pro Touring" suspension. I told ya to turn the wick up! That young lady can drive the wheels off that thing. Great effort from all of you. Holy smokes! That's rolling there now!!! Congrats man, awesome job!!! Gotta love it when a girl can whip the boys buts!!! That's way cool! Congrats to all!! Dude your car is beautiful! Simmons wheels are without a doubt the best looking wheel ever to grace a Turbo Buick! Second behind them would be true GNX style wheels (with the proper offset)! Car looks great! Congrats on the run as well!